Error 800A01A8 is medium-difficult error to solve. The secret of success is knowing where to expect a VBScript method. Another cause is inconsistent use of script variables. 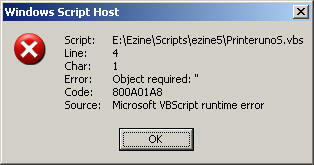 This error code, 800A01A8 usually occurs when you execute a VBScript. My suggestion is that there is a typo in an object or method in your script. The script does not execute as you hoped, instead you get a WSH error message. 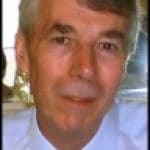 One possibility is that you are using a WSH object does not exist or has not been declared. Your VBScript contains an illegal method, probably a typing mistake or an extra letter. Check the logic of your METHOD statement. Note Source: Microsoft VBScript runtime error. Look for clues particularly the Line: number and check the Char: references. In the example it is Line 4. Char : 1. In this case it is not Char 1 to blame, more that there is something wrong and none of the line can execute. Once you have located the line, pay close attention to the spelling of your objects and methods. Research a similar method in another script. Alternatively, try adding Option Explicit to the beginning of your VBScript. My idea is to discover if you have mistyped the name of a variable. Incidentally, in the WSH message, Source: reports a runtime error not a compilation error, this means you are not looking for a pure syntax problem such as a missing bracket. The most likely cause is a typo which induces faulty logic. In the case of runtime errors, you can use this temporary work around. Add this statement just before the line which errors: On Error Resume Next. Set nets (not Set net). A typo turns into a logical error because nets has not been created, therefore we cannot use it to add a printer. Incidentally, this is a classic case for always using either singular or plural variables. This is an example where a vital command or object is completely missing. As is so often the case, the line number is of great help with code 800xxxxx errors. Here on Line 19 is the error: Set objUser = (strPath). In this instance, ‘[string: "LDAP://cn=elizabeth,"]’ tells only part of the story. There is a problem with cn=elizabeth, but its a missing command GetObject. I solved this problem using the parallel script technique, finding a similar script that worked and then comparing the statements.